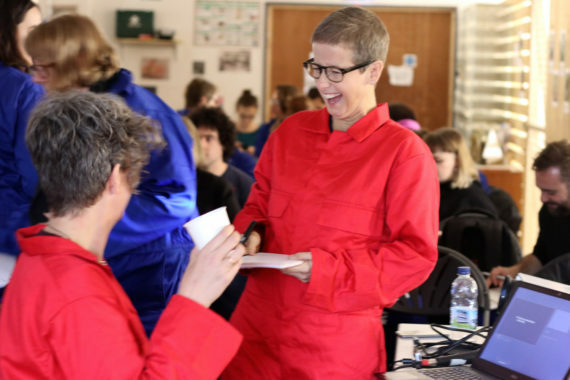 The final a-n Assembly event in the current series began with a self-declared rant courtesy of London-based collaborative duo Sophie Chapman and Kerri Jefferis. Their rallying cry against mainstream notions of how a successful artist behaves and looks gave us all an early chuckle with its suggestion of links between perceived desirable artist traits and the Hare Psychopathy Checklist. Their message, though, was a serious one. Particularly telling was that ‘maintaining a practice’ came last on the pair’s bullet-point list of priorities in the post-degree wasteland – ahead of it were gainful employment, paying bills and forming meaningful relationships. 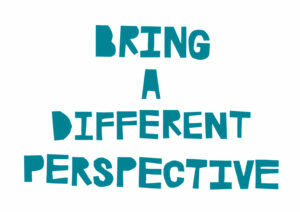 This would prove to be one of the day’s recurring themes – that much of what we talk about when we talk about the artist-led is the everything else that makes it possible. 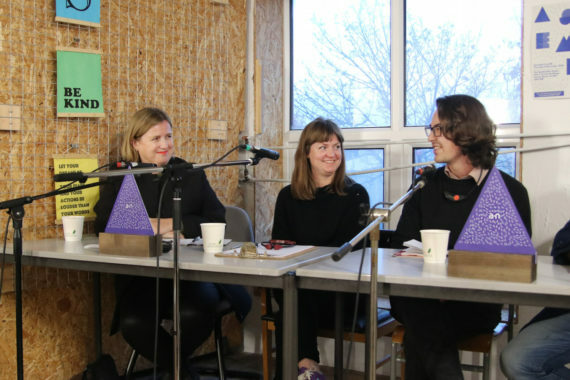 Programmed by Cardiff-based artist Thomas Goddard and hosted by The Sustainable Studio, Assembly Cardiff consisted of a day-long series of presentations and provocations. 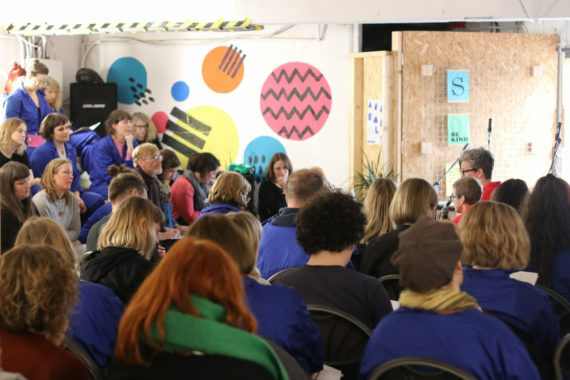 With a focus on sustainability, it highlighted the general resilience and adaptability that defines artist-led communities up and down the UK. Cardiff’s Spit & Sawdust is a case in point. That they provided us with lunch is testament to their skills not only as chefs – a hearty, warming pumpkin soup with homemade sourdough bread and a sweet, seeded flapjack were all scrumptious – but also as an artist-run organisation. 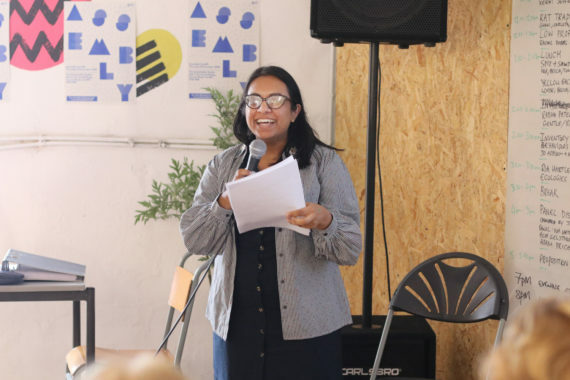 Speaking on the afternoon panel discussion about the need to evolve in order to survive, co-director Nia Metcalfe emphasised that everything else has to be in place before the organisation can pursue its main goal of enabling artists. “We’re a café, a skatepark and a social space, and we find ways to support artists and allow them to make their work,” she said, explaining how this is done through Spit & Sawdust’s studio complex, residencies and exhibition space. These key factors were in evidence during two ‘Artist Soap Box’ presentations from local groups Rat Trap and Radha Patel from Gentle/Radical. 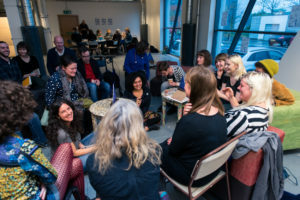 These ably demonstrated the well-organised, warm and supportive nature of the Cardiff artist-led community as recently described by Freya Dooley in her Scene Report feature. Experiences of surviving hard times in another port city were shared by Rachel Dobbs and Hannah Jones. 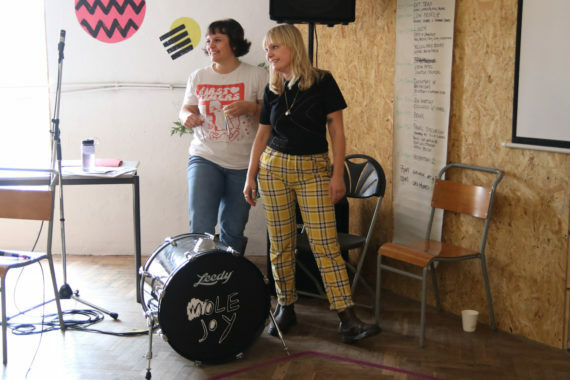 The co-founders of the Plymouth-based collaborative art practice and curatorial entity Low Profile have been friends and collaborators since 2004, and this summer hosted the soft-networking event Jamboree 2018. After lunch it was time for Inventory of Behaviours, a research project developed by artists Jo Addison and Natasha Kidd, BA Fine Art course directors at Kingston University and Bath Spa University respectively. Their presentation offered a change of pace as the high energy of the pre-lunch sessions came up against this Tate Exchange/Freelands Foundation-enabled project. 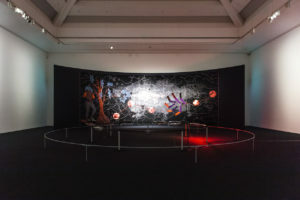 Addison and Kidd’s central message – that of elevating the importance of the many non-art-making activities that the artist must engage with in order to make art – struggled for headway against the tide of anti-university and major gallery sentiment that had been fostered during the earlier sessions. Goddard hinted at the reasons for this when he pointed out that not enough lecturers tell their students, or even know about, what is happening in the artist-led side of the artworld. It was a point the pair addressed in their subsequent Q&A session and informal chats, acknowledging that there is a bridge that needs building between art education and the precariousness of post-graduation artist life. This point was bolstered during Manchester-based artist Ria Hartley’s short film on her project, ‘ecologies of care’, which cited a polluted river as a metaphor for elements of the cultural and creative industries that may be toxic to practitioners. The final contribution of the day came from Goddard who stated – not unreasonably – that when someone rises through the artist-led community, they have a responsibility to reach back down and help others.